When it comes to teeth straightening, Invisalign is a solution in Singapore that is a state of the art dental technology that is non-invasive and relatively painless. Made of smooth, comfortable, strong plastic that is specially fitted to your teeth, Invisalign works to gradually and gently straighten your smile. Not only is Invisalign extremely effective, but it spares the teenagers any embarrassment usually associated with metal braces since Invisalign braces are invisible to the naked eye, allowing you to maintain pride over your smile! This confidence boost is a huge reason behind why Invisalign is also a great solution for teens: studies have proven that a whopping 92% of adolescents feel that wearing metal braces would keep them from fitting in with their peers. Not only that, Invisalign aligners also are super easy to take care of and to keep clean. 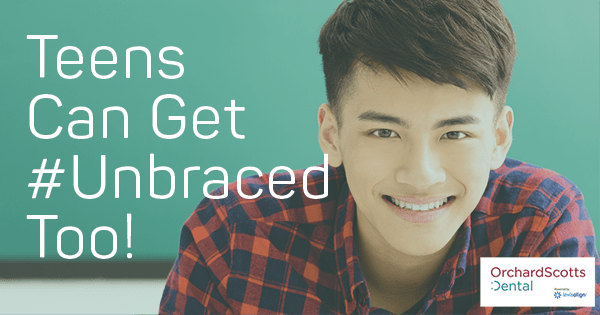 This is a huge factor when it comes to fitting teenagers with orthodontic appliances­ because very often, dentists find that teenagers struggle to keep their braces or retainers at the optimal level of cleanliness. Taking care of Invisalign aligners is easy because­ both teenagers and adults can simply remove their aligners and brush them gently with a toothbrush and put them back on again. Studies have actually proven that Invisalign aligners reduce the chance of a patient developing mouth and gum diseases as a product of poor orthodontic appliance care. Therefore, a good dentist in Singapore should consider Invisalign aligners as a first line treatment plan to teenagers versus metal braces or other fixed orthodontic appliances. When teenagers opt for Invisalign technology treatment, they are greatly reducing their chances of poor dental hygiene that could lead to dental disease­s and they are simultaneously ensuring their teeth straightening efforts are optimal! What is the Difference Between Invisalign for Adults and Invisalign for Teens? Invisalign for Teens is just like Invisalign for Adults: it is effective, painless, invisible, and specially fitted to your teeth. The only difference between Invisalign for Teens and Invisalign for Adults is that the teen version of this fantastic, relatively invisible orthodontic technology includes a useful extra feature – Invisalign for Teens comes with a built in blue indicator that fades with use. This indicator encourages teens to be diligent in their wearing of the Invisalign.­ If they consistently wear the aligners, the blue indicator will fade at the end of two weeks’ time. The indicator ensures that teens are using their aligners to their full potential so that they get the most optimal results. The Invisalign for Teens package also includes the allowance of three sets of free replacement aligners, while Invisalign for Adults does not. The reason behind these complimentary aligners is that teenagers are statistically proven to be far more likely to misplace their aligners than are adults!